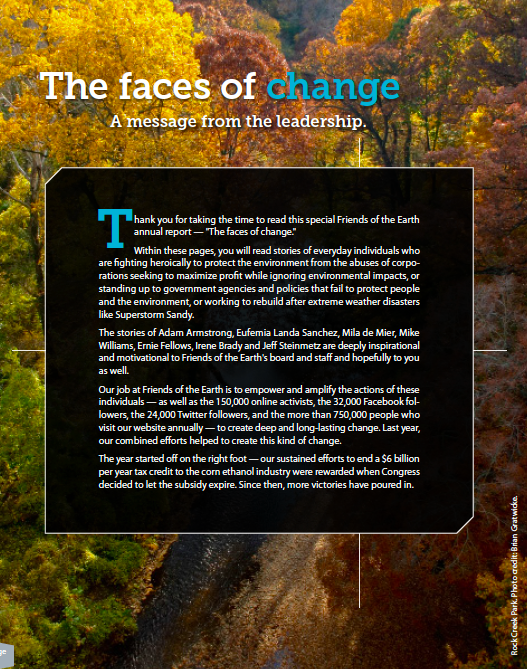 Friends of the Earth just published their Annual Report for 2012 (from this page you can download the whole report as a PDF). 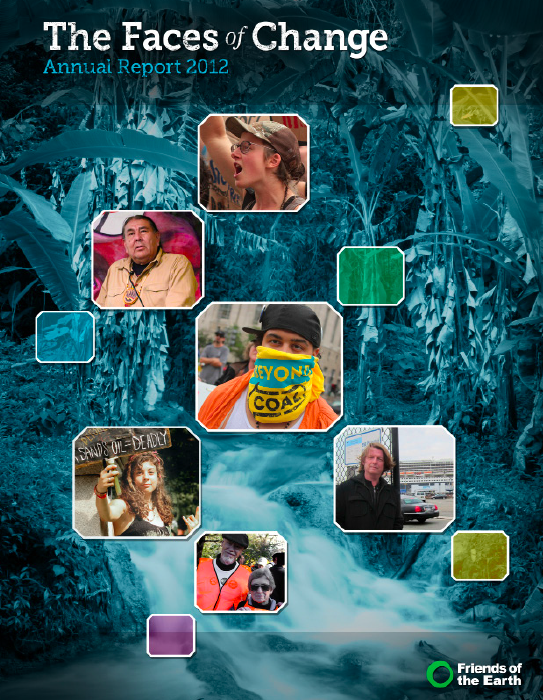 This year they are calling their report "The Faces of Change" and in it you will, in their words, "read the stories of everyday individuals who are fighting heroically to protect the environment from the abuses of corporations seeking to maximize profit while ignoring environmental impacts, or standing up to government agencies and policies that fail to protect the environment, or working to rebuild after extreme weather disasters like Superstorm Sandy." 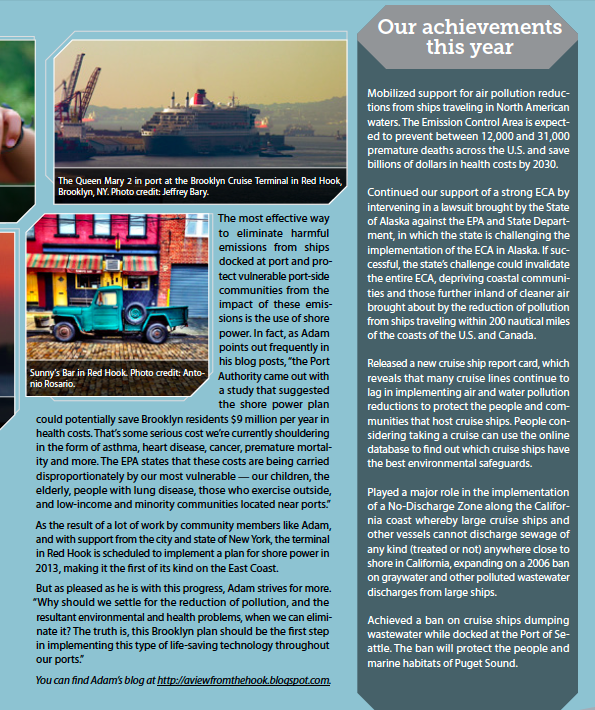 In this year's report, Friends of the Earth decided to focus on seven individuals, and I am honored to say that they chose to include me, this blog, our community and the efforts we have all made, over many years, to eliminate cruise ship pollution in Red Hook. 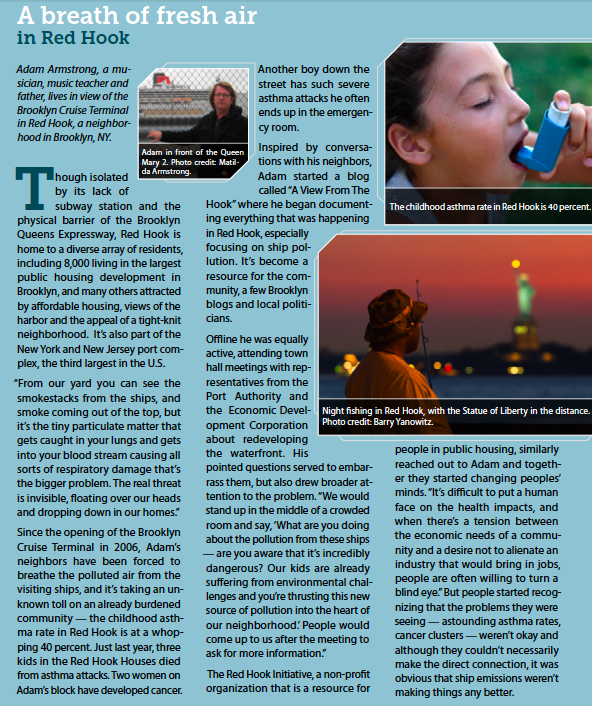 The piece on Red Hook highlights the Brooklyn Cruise Terminal "shore power" plan, which will allow the idling cruise ships to turn off their dirty-diesel engines while in port and plug into the city's electricity grid, thereby eliminating tons of dangerous emissions - NOx, SOx, PM (soot), CO2 - which currently spew over our neighborhood (and beyond) and into our residents' lungs. NOTE: Although the shore power plan was approved nearly 2 years ago, as this South Brooklyn Post article reminds us, it has yet to come "on-line". The most recent statements from the City state that the plan will be up and running in 2014. Meanwhile, these carcinogenic and asthma inducing substances still continue to pump out of the idling cruise ships (and container ships too - but that's another story) that berth at our residential neighborhood's waterfront. I am certainly grateful to Friends of the Earth for highlighting our local story and this important issue. I would like to thank John Kaltenstein who works on these issues for Friends of the Earth and advocates for better maritime environmental standards at the IMO (International Maritime Organization) and elsewhere. He contacted me many years ago when he saw that I was trying to raise awareness of the dangers of port pollution in Red Hook and throughout the ports of New York and New Jersey - from the emissions of ships, trucks and other sources - and he encouraged me to keep getting out the word, sharing information, and himself sharing information with me and drawing attention to the issue in articles like this in Sustainable Shipping - "The Big Apple's Big Shipping Pollution Problem". John made the suggestion to his colleague, Lisa Stone, who is the publications manager at FOE, to include our story in this year's report. FOE has played a tremendous role in raising awareness of the dangers of ship emissions, whether from cruise ships, container ships, or other large oceangoing vessels. They have worked on establishing better emissions standards for ships, through the use of lower sulfur fuels and the establishment of "Emissions Control Areas", as is being implemented in the coastal waters of North America, and have pressed for the use of shore power. They have highlighted the environmental impacts of the cruise industry, and every year release a "Cruise Report Card" which allows potential vacationers to assess and compare a cruise ship or cruise line's "environmental and human health impacts". (FYI - The Queen Mary 2 gets an "F" for "air pollution reduction"). Their work on these matters has been exemplary. Our inclusion in the Annual Report is heartening recognition of the effort that our community has made on these important issues. But it's still important to recognize that we've still got a long way to go - in Red Hook, our city, and around the country. As I stated, the Brooklyn Cruise Terminal "shore power" plan still isn't up and running. I haven't heard that there has been any negative impact on that plan resulting from the aftermath of Superstorm Sandy - whether it be delays or otherwise - but the NYCEDC and Port Authority haven't been the most communicative entities in the City, so we'll just have to hope everything is going according to plan. Also, this shouldn't be the end of the establishment of shore power at our city's ports, it should be the beginning. There should be a plan to use this technology throughout our ports - the third largest in the country - at cruise ship terminals (hello West Side!) and container terminals, as is being done on the West Coast and elsewhere. Mayor Bloomberg has not been very outspoken on these issues, and though the acknowledgment of "port pollution" made it into the City's "Vision 2020 - Comprehensive Waterfront Plan" (barely, because initial drafts of the plan made no mention of the pollution impacts of ships, ports, etc. - nor ways to mitigate that pollution! ), the issue gets no exposure through the Mayor's office, nor - to its great shame - through the press. Perhaps a new Mayor will be more "out front" on port pollution issues, as any mayor of a great port city should be, but we'll have to see about that. “Bunker fuel is so dirty that even the cleaner bunker fuel is hundreds of times dirtier than on-road diesel fuel,” Keever said, referring to the fact that the current fuel is 650 times dirtier than truck diesel fuel. Cruise ships run their engines while in port to power the cabins for passengers and crew. For a 2,500-passenger ship with a crew of 1,000, the sulfur dioxide emissions for a 10-hour stay equal that of more than 34,000 diesel trucks idling for the same amount of time, based on calculations vetted by the U.S. Environmental Protection Agency. Then there is the story from Maritime Professional about Hong Kong - "Ship Emissions an Afterthought at Hong Kong Cruise Terminal". This is a very familiar story to the residents of Red Hook. There is much being done to try to fight for measures to reduce this pollution and its terrible health impacts - whether locally or globally - on our port-side communities, often borne by the most vulnerable. Friends of the Earth have been at the forefront of that fight. I so appreciate Friends of the Earth raising the awareness of Red Hook's part of the story, and I am honored to be included in their Annual Report 2012 as someone who has played a role in that story - as a "Face of Change".